Skeletal muscle is one of three major muscle types, the others being cardiac muscle and smooth muscle. It is a form of striated muscle tissue, which is under the voluntary control of the somatic nervous system. Most skeletal muscles are attached to bones by bundles of collagen fibers known as tendons. Muscle fibers are in turn composed of myofibrils. The myofibrils are composed of actin and myosin filaments, repeated in units called sarcomeres, which are the basic functional units of the muscle fiber. The sarcomere is responsible for the striated appearance of skeletal muscle and forms the basic machinery necessary for muscle contraction. Connective tissue is present in all muscles as fascia. Enclosing each muscle is a layer of connective tissue known as the epimysium; enclosing each fascicle is a layer called the perimysium, and enclosing each muscle fiber is a layer of connective tissue called the endomysium. 3D rendering of a skeletal muscle fiber. Muscle fibers are the individual contractile units within a muscle. A single muscle such as the biceps brachii contains many muscle fibers. Another group of cells, the myosatellite cells are found between the basement membrane and the sarcolemma of muscle fibers. These cells are normally quiescent but can be activated by exercise or pathology to provide additional myonuclei for muscle growth or repair. Individual muscle fibers are formed during development from the fusion of several undifferentiated immature cells known as myoblasts into long, cylindrical, multi-nucleated cells. Differentiation into this state is primarily completed before birth with the cells continuing to grow in size thereafter. Skeletal muscle exhibits a distinctive banding pattern when viewed under the microscope due to the arrangement of cytoskeletal elements in the cytoplasm of the muscle fibers. The principal cytoplasmic proteins are myosin and actin (also known as "thick" and "thin" filaments, respectively) which are arranged in a repeating unit called a sarcomere. The interaction of myosin and actin is responsible for muscle contraction. Every single organelle and macromolecule of a muscle fiber is arranged to ensure form meets function. The cell membrane is called the sarcolemma with the cytoplasm known as the sarcoplasm. 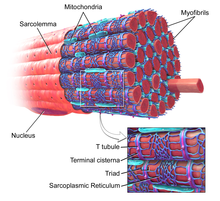 In the sarcoplasm are the myofibrils. The myofibrils are long protein bundles about 1 micrometer in diameter each containing myofilaments. Pressed against the inside of the sarcolemma are the unusual flattened myonuclei. Between the myofibrils are the mitochondria. While the muscle fiber does not have smooth endoplasmic cisternae, it contains a sarcoplasmic reticulum. The sarcoplasmic reticulum surrounds the myofibrils and holds a reserve of the calcium ions needed to cause a muscle contraction. Periodically, it has dilated end sacs known as terminal cisternae. These cross the muscle fiber from one side to the other. In between two terminal cisternae is a tubular infolding called a transverse tubule (T tubule). T tubules are the pathways for action potentials to signal the sarcoplasmic reticulum to release calcium, causing a muscle contraction. Together, two terminal cisternae and a transverse tubule form a triad. Muscle architecture refers to the arrangement of muscle fibers relative to the axis of force generation of the muscle. This axis is a hypothetical line from the muscle's origin to insertion. For some longitudinal muscles, such as the biceps brachii, this is a relatively simple concept. For others, such as the rectus femoris or deltoid muscle, it becomes more complicated. While the muscle fibers of a fascicle lie parallel to one another, the fascicles themselves can vary in their relationship to one another and to their tendons. The different fiber arrangements produce broad categories of skeletal muscle architectures including longitudinal, pennate, unipennate, bipennate, and multipennate. 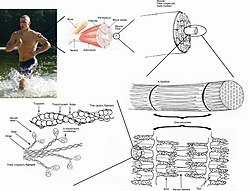 Because of these different architectures, the tension a muscle can create between its tendons varies by more than simply its size and fiber-type makeup. The fascicles of longitudinally arranged, parallel, or fusiform muscles run parallel to the axis of force generation, thus these muscles on a whole function similarly to a single, large muscle fiber. Variations exist, and the different terms are often used more specifically. For instance, fusiform refers to a longitudinal architecture with a widened muscle belly (biceps), while parallel may refer to a more ribbon-shaped longitudinal architecture (rectus abdominis). A less common example would be a circular muscle such as the orbicularis oculi, in which the fibers are longitudinally arranged, but create a circle from origin to insertion. The fibers in unipennate muscles are all oriented at the same (but non-zero) angle relative to the axis of force generation. This angle reduces the effective force of any individual fiber, as it is effectively pulling off-axis. However, because of this angle, more fibers can be packed into the same muscle volume, increasing the Physiological cross-sectional area (PCSA). This effect is known as fiber packing, and—in terms of force generation—it more than overcomes the efficiency loss of the off-axis orientation. The trade-off comes in overall speed of muscle shortening and in the total excursion. Overall muscle shortening speed is reduced compared to fiber shortening speed, as is the total distance of shortening. All of these effects scale with pennation angle; greater angles lead to greater force due to increased fiber packing and PCSA, but with greater losses in shortening speed and excursion. The vastus lateralis is an example of unipennate architecture. The fibers in multipennate muscles are arranged at multiple angles in relation to the axis of force generation, and are the most general and most common architecture. Several fiber orientations fall into this category; bipennate, convergent, and multipennate. While the determination of PCSA becomes more difficult in these muscle architectures, the same tradeoffs as listed above apply. Bipennate arrangements are essentially "V"s of fibers stacked on top of each other, such as in the rectus femoris. Convergent arrangements are triangle or fan-shaped, with wide origins and more narrow insertions. The wide variation of pennation angles in this architecture can actually allow for multiple functions. For instance, the trapezius, a prototypical convergent muscle, can aid in both shoulder elevation and depression. Multipennate arrangements are not limited to a particular arrangement, but—when used specifically—commonly refer to what is essentially a combination of bipennate or unipennate arrangements with convergent arrangements. An example of this architecture would be the human deltoid muscle. The flexor and extensor; abductor and adductor; levator and depressor; supinator and pronator; sphincter, tensor, and rotator muscles. A flexor muscle decreases the anterior angle at a joint; an extensor increases the anterior angle at a joint. An abductor moves a bone away from the midline; an adductor moves a bone closer to the midline. A levator raises a structure; a depressor moves a structure down. A supinator turns the palm of the hand up; a pronator turns the palm down. A sphincter decreases the size of an opening; a tensor tenses a body part; a rotator turns a bone around its axis. In addition to the actin and myosin components that constitute the sarcomere, skeletal muscle fibers also contain two other important regulatory proteins, troponin and tropomyosin, that are necessary for muscle contraction to occur. These proteins are associated with actin and cooperate to prevent its interaction with myosin. Skeletal muscle cells are excitable and are subject to depolarization by the neurotransmitter acetylcholine, released at the neuromuscular junction by motor neurons. Once a cell is sufficiently stimulated, the cell's sarcoplasmic reticulum releases ionic calcium (Ca2+), which then interacts with the regulatory protein troponin. Calcium-bound troponin undergoes a conformational change that leads to the movement of tropomyosin, subsequently exposing the myosin-binding sites on actin. This allows for myosin and actin ATP-dependent cross-bridge cycling and shortening of the muscle. Muscle force is proportional to physiologic cross-sectional area (PCSA), and muscle velocity is proportional to muscle fiber length. The torque around a joint, however, is determined by a number of biomechanical parameters, including the distance between muscle insertions and pivot points, muscle size and Architectural gear ratio. Muscles are normally arranged in opposition so that when one group of muscles contracts, another group relaxes or lengthens. Antagonism in the transmission of nerve impulses to the muscles means that it is impossible to fully stimulate the contraction of two antagonistic muscles at any one time. During ballistic motions such as throwing, the antagonist muscles act to 'brake' the agonist muscles throughout the contraction, particularly at the end of the motion. In the example of throwing, the chest and front of the shoulder (anterior Deltoid) contract to pull the arm forward, while the muscles in the back and rear of the shoulder (posterior Deltoid) also contract and undergo eccentric contraction to slow the motion down to avoid injury. Part of the training process is learning to relax the antagonist muscles to increase the force input of the chest and anterior shoulder. Contracting muscles produce vibration and sound. Slow twitch fibers produce 10 to 30 contractions per second (10 to 30 Hz). Fast twitch fibers produce 30 to 70 contractions per second (30 to 70 Hz). The vibration can be witnessed and felt by highly tensing one's muscles, as when making a firm fist. The sound can be heard by pressing a highly tensed muscle against the ear, again a firm fist is a good example. The sound is usually described as a rumbling sound. Some individuals can voluntarily produce this rumbling sound by contracting the tensor tympani muscle of the middle ear. The rumbling sound can also be heard when the neck or jaw muscles are highly tensed. Skeletal muscle fiber-type phenotype in adult animals is regulated by several independent signaling pathways. These include pathways involved with the Ras/mitogen-activated protein kinase (MAPK) pathway, calcineurin, calcium/calmodulin-dependent protein kinase IV, and the peroxisome proliferator γ coactivator 1 (PGC-1). The Ras/MAPK signaling pathway links the motor neurons and signaling systems, coupling excitation and transcription regulation to promote the nerve-dependent induction of the slow program in regenerating muscle. Calcineurin, a Ca2+/calmodulin-activated phosphatase implicated in nerve activity-dependent fiber-type specification in skeletal muscle, directly controls the phosphorylation state of the transcription factor NFAT, allowing for its translocation to the nucleus and leading to the activation of slow-type muscle proteins in cooperation with myocyte enhancer factor 2 (MEF2) proteins and other regulatory proteins. Ca2+/calmodulin-dependent protein kinase activity is also upregulated by slow motor neuron activity, possibly because it amplifies the slow-type calcineurin-generated responses by promoting MEF2 transactivator functions and enhancing oxidative capacity through stimulation of mitochondrial biogenesis. Contraction-induced changes in intracellular calcium or reactive oxygen species provide signals to diverse pathways that include the MAPKs, calcineurin and calcium/calmodulin-dependent protein kinase IV to activate transcription factors that regulate gene expression and enzyme activity in skeletal muscle. PGC1-α (PPARGC1A), a transcriptional coactivator of nuclear receptors important to the regulation of a number of mitochondrial genes involved in oxidative metabolism, directly interacts with MEF2 to synergistically activate selective slow twitch (ST) muscle genes and also serves as a target for calcineurin signaling. A peroxisome proliferator-activated receptor δ (PPARδ)-mediated transcriptional pathway is involved in the regulation of the skeletal muscle fiber phenotype. Mice that harbor an activated form of PPARd display an “endurance” phenotype, with a coordinated increase in oxidative enzymes and mitochondrial biogenesis and an increased proportion of ST fibers. Thus—through functional genomics—calcineurin, calmodulin-dependent kinase, PGC-1α, and activated PPARδ form the basis of a signaling network that controls skeletal muscle fiber-type transformation and metabolic profiles that protect against insulin resistance and obesity. The transition from aerobic to anaerobic metabolism during intense work requires that several systems are rapidly activated to ensure a constant supply of ATP for the working muscles. These include a switch from fat-based to carbohydrate-based fuels, a redistribution of blood flow from nonworking to exercising muscles, and the removal of several of the by-products of anaerobic metabolism, such as carbon dioxide and lactic acid. Some of these responses are governed by transcriptional control of the fast twitch (FT) glycolytic phenotype. For example, skeletal muscle reprogramming from an ST glycolytic phenotype to an FT glycolytic phenotype involves the Six1/Eya1 complex, composed of members of the Six protein family. Moreover, the hypoxia-inducible factor 1-α (HIF1A) has been identified as a master regulator for the expression of genes involved in essential hypoxic responses that maintain ATP levels in cells. Ablation of HIF-1α in skeletal muscle was associated with an increase in the activity of rate-limiting enzymes of the mitochondria, indicating that the citric acid cycle and increased fatty acid oxidation may be compensating for decreased flow through the glycolytic pathway in these animals. However, hypoxia-mediated HIF-1α responses are also linked to the regulation of mitochondrial dysfunction through the formation of excessive reactive oxygen species in mitochondria. Other pathways also influence adult muscle character. For example, physical force inside a muscle fiber may release the transcription factor serum response factor (SRF) from the structural protein titin, leading to altered muscle growth.It show sarcomere. Unit of contractions and relaxation is 1.6 to 2.2 micrometer. It also has about 10,000 myofibrils. Diseases of skeletal muscle are termed myopathies, while diseases of nerves are called neuropathies. Both can affect muscle function and/or cause muscle pain, and fall under the umbrella of neuromuscular disease. Myopathies have been modeled with cell culture systems of muscle from healthy or diseased tissue biopsies. Another source of skeletal muscle and progenitors is provided by the directed differentiation of pluripotent stem cells . Research on skeletal muscle properties uses many techniques. Electrical muscle stimulation is used to determine force and contraction speed at different stimulation frequencies, which are related to fiber-type composition and mix within an individual muscle group. In vitro muscle testing is used for more complete characterization of muscle properties. The electrical activity associated with muscle contraction are measured via electromyography (EMG). EMG is a common technique used in many disciplines within the Exercise and Rehab Sciences. Skeletal muscle has two physiological responses: relaxation and contraction. The mechanisms for which these responses occur generate electrical activity measured by EMG. Specifically, EMG can measure the action potential of a skeletal muscle, which occurs from the hyperpolarization of the motor axons from nerve impulses sent to the muscle (1). EMG is used in research for determining if the skeletal muscle of interest is being activated, the amount of force generated, and an indicator of muscle fatigue. The two types of EMG are intra-muscular EMG and the most common, surface EMG. The EMG signals are much greater when a skeletal muscle is contracting verses relaxing. However, for smaller and deeper skeletal muscles the EMG signals are reduced and therefore are viewed as a less valued technique for measuring the activation. In research using EMG, a maximal voluntary contraction (MVC) is commonly performed on the skeletal muscle of interest, to have reference data for the rest of the EMG recordings during the main experimental testing for that same skeletal muscle. B. K. Pedersen and her colleagues have conducted research showing that skeletal muscle functions as an endocrine organ by secreting cytokines and other peptides, now referred to as myokines. Myokines in turn are believed to mediate the health benefits of exercise. ^ Birbrair, Alexander; Zhang, Tan; Wang, Zhong-Min; Messi, Maria Laura; Enikolopov, Grigori N.; Mintz, Akiva; Delbono, Osvaldo (2013-03-21). "Role of Pericytes in Skeletal Muscle Regeneration and Fat Accumulation". Stem Cells and Development. 22 (16): 2298–2314. doi:10.1089/scd.2012.0647. ISSN 1547-3287. PMC 3730538. PMID 23517218. ^ Zammit, PS; Partridge, TA; Yablonka-Reuveni, Z (November 2006). "The skeletal muscle satellite cell: the stem cell that came in from the cold". Journal of Histochemistry and Cytochemistry. 54 (11): 1177–91. doi:10.1369/jhc.6r6995.2006. PMID 16899758. ^ Saladin, Kenneth S. (2010). Anatomy and Physiology (3rd ed.). New York: Watnick. pp. 405–406. ISBN 9780072943689. ^ a b c Martini, Frederic H.; Timmons, Michael J.; Tallitsch, Robert B. (2008). Human Anatomy (6 ed.). Benjamin Cummings. pp. 251–252. ISBN 978-0-321-50042-7. ^ a b c d Lieber, Richard L. (2002) Skeletal muscle structure, function, and plasticity. Wolters Kluwer Health. ^ a b Tortora, G; Anagnostakos, N (1987). Principles of anatomy and physiology (5th. Harper international ed.). Harper & Row. p. 219. ISBN 0063507293. ^ Costanzo, Linda S. (2002). Physiology (2nd ed.). Philadelphia: Saunders. p. 23. ISBN 0-7216-9549-3. ^ Barry, D. T. (1992). "Vibrations and sounds from evoked muscle twitches". Electromyogr Clin Neurophysiol. 32 (1–2): 35–40. PMID 1541245. ^ Chal J, Oginuma M, Al Tanoury Z, Gobert B, Sumara O, Hick A, Bousson F, Zidouni Y, Mursch C, Moncuquet P, Tassy O, Vincent S, Miyanari A, Bera A, Garnier JM, Guevara G, Hestin M, Kennedy L, Hayashi S, Drayton B, Cherrier T, Gayraud-Morel B, Gussoni E, Relaix F, Tajbakhsh S, Pourquié O (August 2015). "Differentiation of pluripotent stem cells to muscle fiber to model Duchenne muscular dystrophy". Nature Biotechnology. 33: 962–9. doi:10.1038/nbt.3297. PMID 26237517. ^ Cè, E; Rampichini, S; Limonta, E; Esposito, F (Dec 10, 2013). "Fatigue effects on the electromechanical delay components during the relaxation phase after isometric contraction". Acta Physiologica. 211 (1): 82–96. doi:10.1111/apha.12212. PMID 24319999. ^ Xu, Q; Quan, Y; Yang, L; He, J (Jan 2013). "An adaptive algorithm for the determination of the onset and offset of muscle contraction by EMG signal processing". IEEE Transactions on Neural Systems and Rehabilitation Engineering. 21 (1): 65–73. doi:10.1109/TNSRE.2012.2226916. PMID 23193462. ^ Milder, DA; Sutherland, EJ; Gandevia, SC; McNulty, PA (2014). "Sustained maximal voluntary contraction produces independent changes in human motor axons and the muscle they innervate". PLoS ONE. 9 (3): e91754. Bibcode:2014PLoSO...991754M. doi:10.1371/journal.pone.0091754. PMC 3951451. PMID 24622330. ^ Pedersen, B. K. (2013). "Muscle as a Secretory Organ". Comprehensive Physiology. Comprehensive Physiology. 3. pp. 1337–62. doi:10.1002/cphy.c120033. ISBN 9780470650714. PMID 23897689. This page was last edited on 13 March 2019, at 13:10 (UTC).